Hmm, isn’t this type of “CNC machine” more customarily known as a drum plotter? It would be so simple to add a Z axis actuator, I wonder why one wasn’t added. Using a human hand as an actuator is a great idea; but I think it could be brought a step further. With a few properly placed electrodes, you could probably automate the plunger-clicking using only existing hardware. You’ll have to check the specs for proper voltages, etc. Considering the z axis is binary, relying on time to create a larger dot, i’d suggest using a solenoid. The amount of time should be short enough that you won’t burn out a coil. OK, maybe I’m missing something here. Does the operator really have to press down the pen separately for EACH PIXEL? Presumably while reading off a list of how big each pixel should be? If so, wouldn’t a simpler, cheaper, and overall better solution be just a piece of plastic with a grid of pen-nib-sized holes, to use as a stencil? So… the only benefit of this, is that you don’t have to choose where to place the pen, just how long to hold it. It still takes you almost the same amount of time to draw a picture. I’d call it useless. Unless you automated the pen action, then it might make some sense. 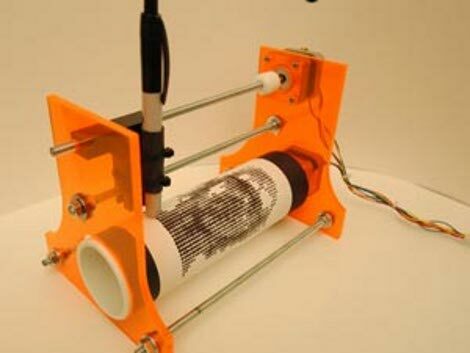 Like some kind of printer… could be fun to print in “weird” inks like silver, copper, or raspberry. On the other hand, if the creators wanted an “artsy” interpretation of how we people interact with machines… you could forget the motors, and have someone manually move the pen and drum. Reading the positions off a screen would be a plus, too. Pretty cool. It would be really cool to see designs like this created for reprap printers to print the parts. It would be a snap to build more of them. I quess laser cutters are not high end, but two pieces of wood clamped together and drilled with a hand electric drill is. If you used thermal paper you could replace the pen with a piece of heated wire. Ugh, that was a pretty sparse write up between tons of advertisements. I’d like to know more about how they constructed the frame and what hardware they used but I can’t find any details about that.